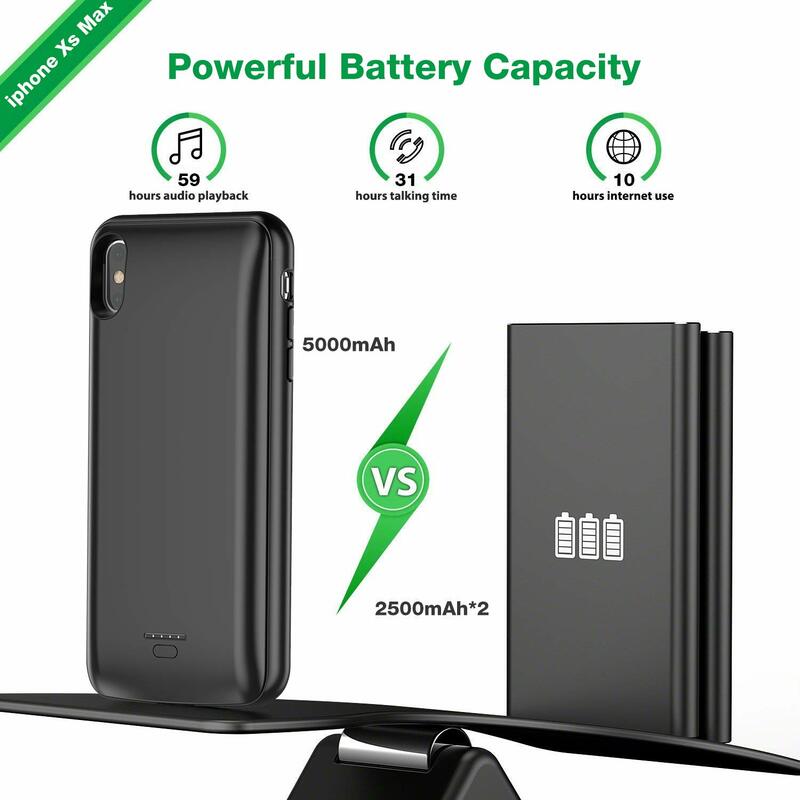 [120%+ MORE BATTERY LIFE] The powerful 5000mAh Li-polymer rechargeable battery case can keep your iPhone XS MAX charged the entire day. 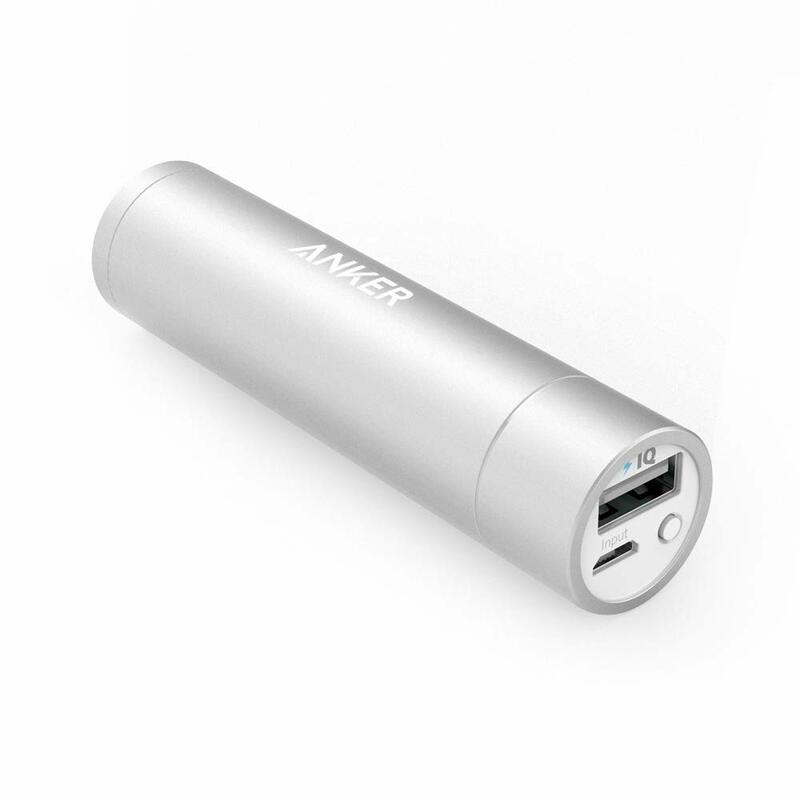 With portable design, charging anytime and anywhere. [COMPATIBLE WITH Qi WIRELESS CHARGING] Charge Force Wireless Technology does away with all the wires and introduces a whole new way to power your phone without the use of cables. 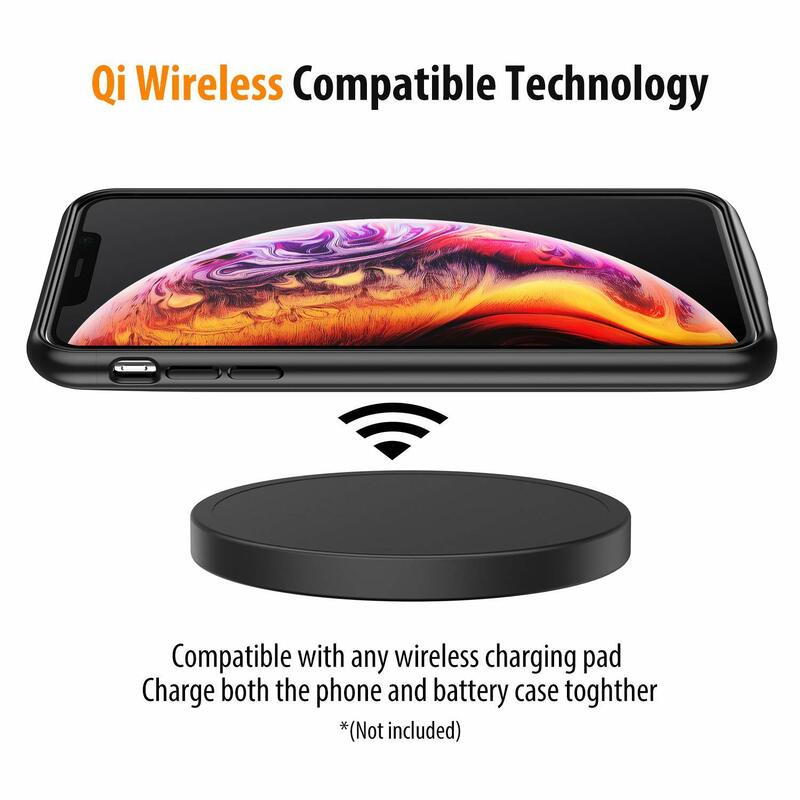 You can use any Qi wireless charging pad (not included) to charge both the phone and the battery case together. 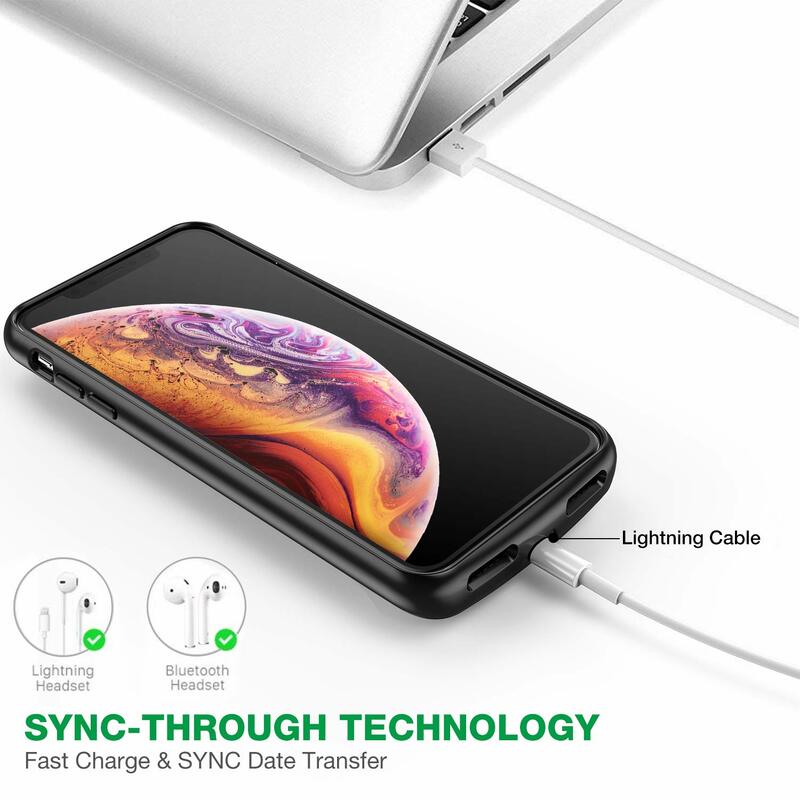 [CHARGE & ENJOY MUSIC VIA LIGHTNING EARPHONE] Adopted optimized polymer-sync tech, enables you to enjoy music with lightning handset even while you’re charging via this upgraded battery case for Apple iPhone Xs Max! 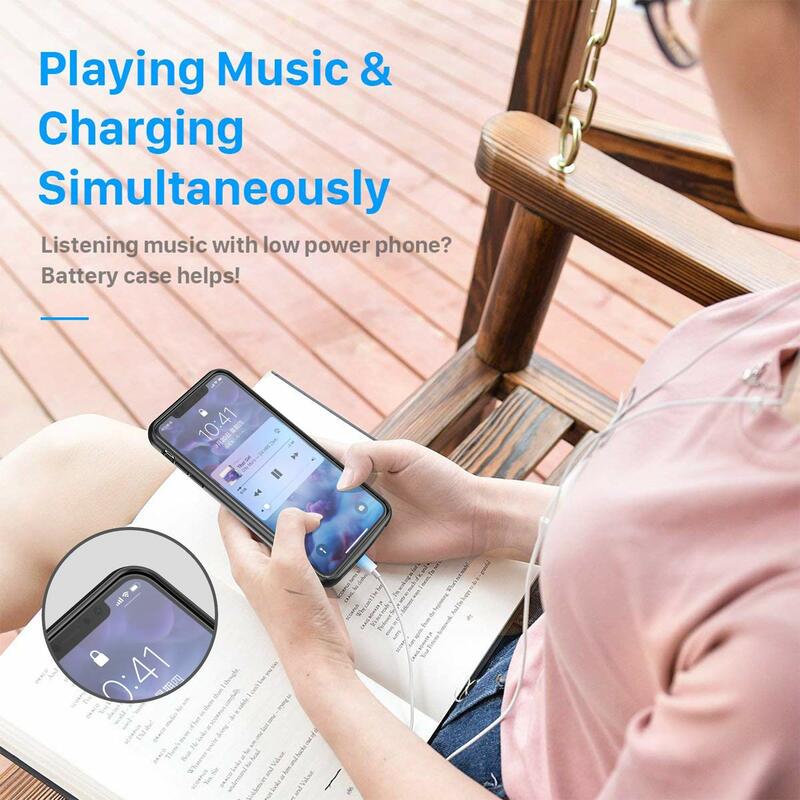 Listening to music and charging won’t be a dilemma. 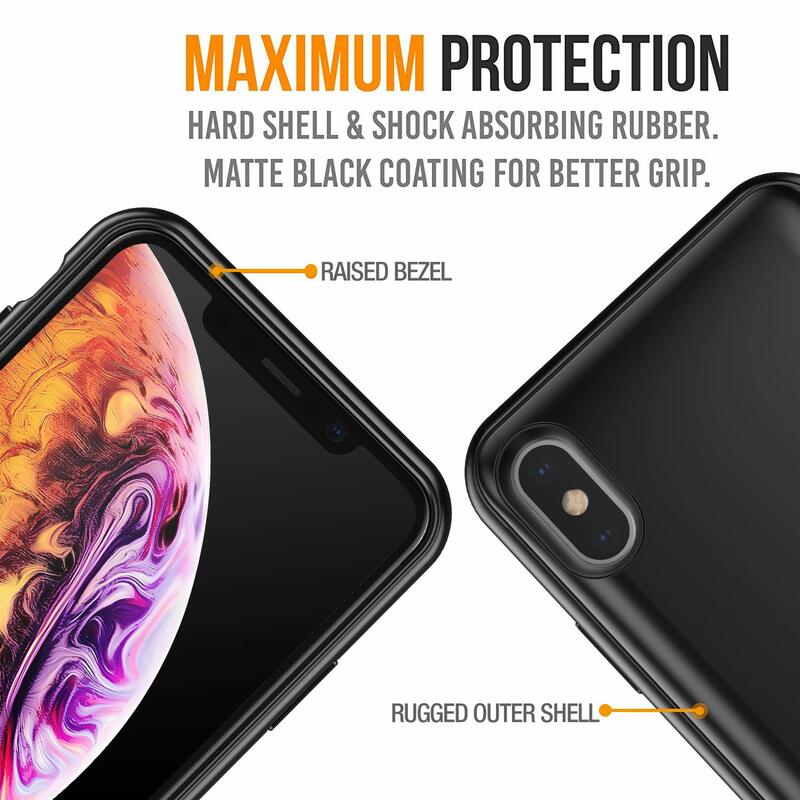 [HIGH IMPACT PROTECTION & SYNC TECH & EASY INSTALLATION] Works with all functions of your iPhone XS MAX charging case. 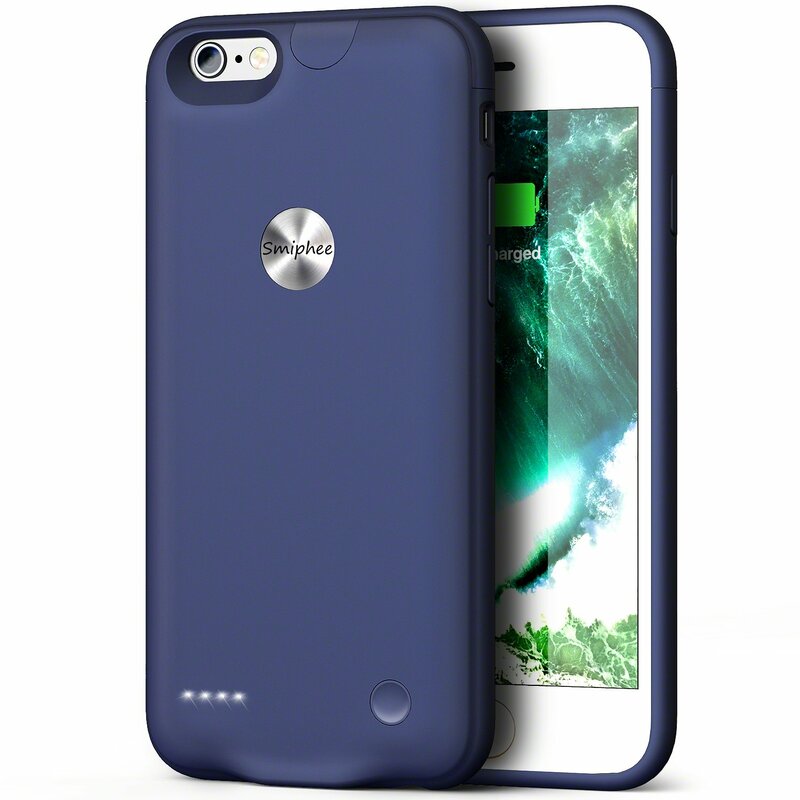 The light-weight case features rubberized support pads on the interior for drops and hard falls, and rasied corners for added protection against cracked screens.★. 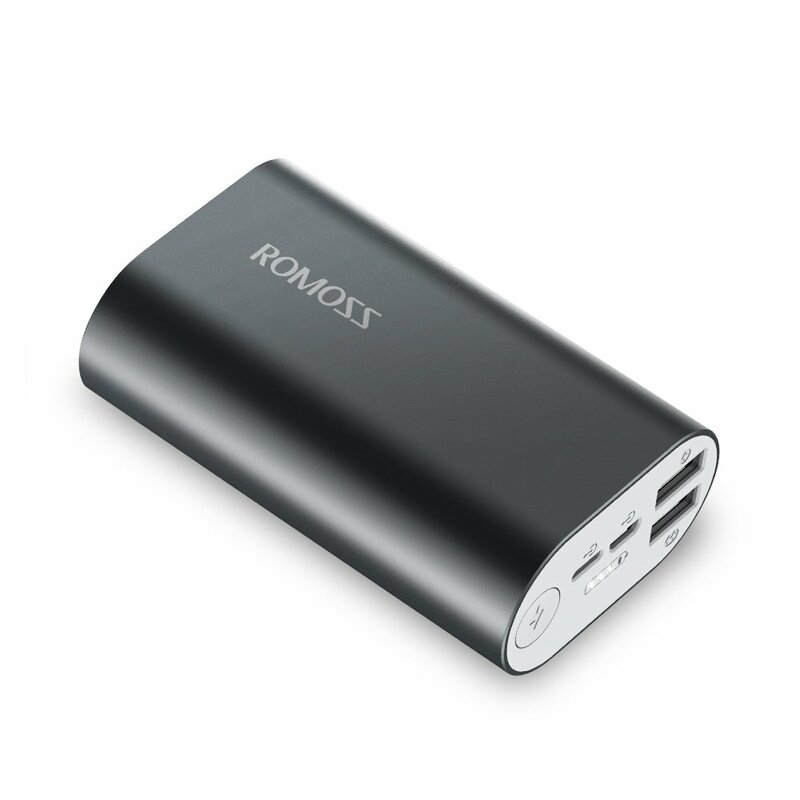 It supports syncing data to your Macbook, PC or laptop and charging your cellphone simultaneously without removing it. 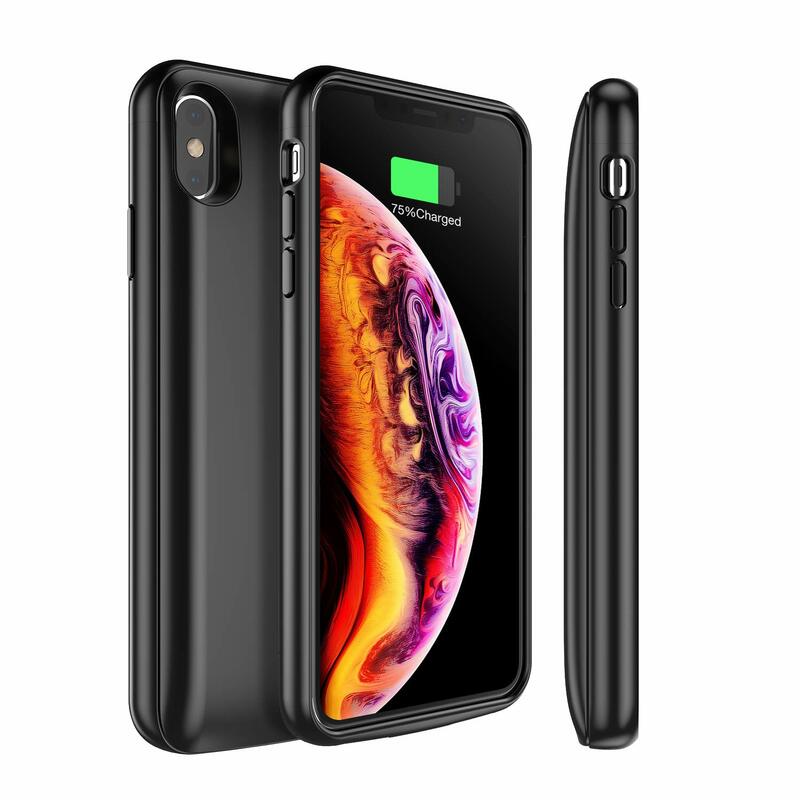 ★★★[LIFETIME WARRANTY] SPECIALLY DESIGNED COMPATIBLE THE IPHONE XS MAX– Charging Port and buttons are still easily accessible ★We provide these iPhone XS MAX Battery Case with life-Warranty and 24/7 customer service. Have any issue with product quality, kindly EMAIL OUR SUPPORT TEAM. I’ve been hoping for a good battery case and decided since this one does Lightning cable (versus the usual micro usb) and Wireless I should give it a try. Not sure why Qi wireless is so rare in the cases out there but I’m glad this one got it! I just got it and put it on and already a few things bug me. These may not matter to you though. First the good stuff: the material feels nice in the hand, very pleasant soft plastic. 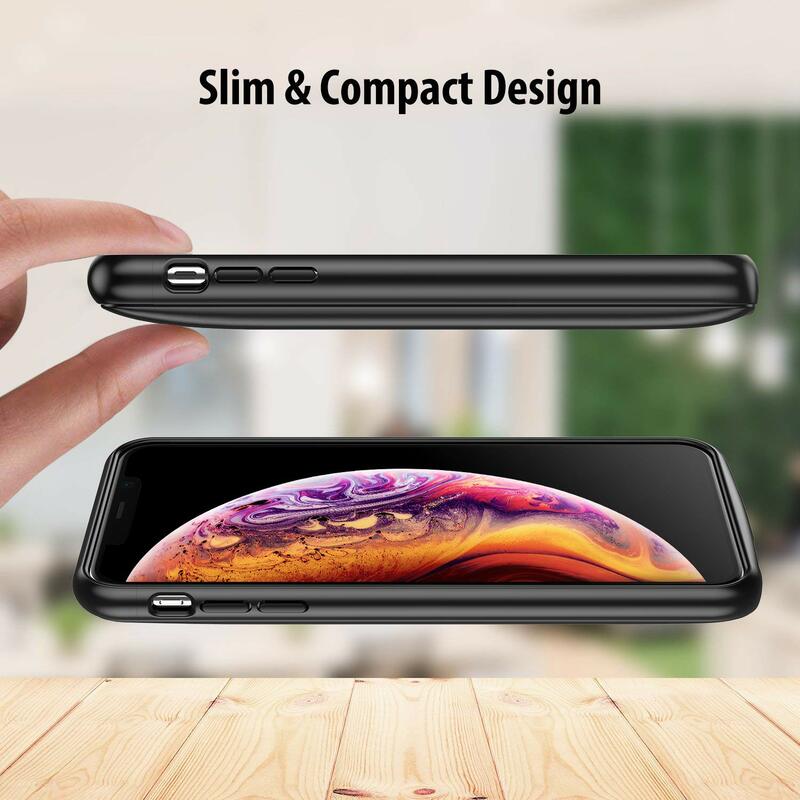 Very nice design also and it doesn’t add a “chin” to the phone like many such battery cases do... which is great since going bezel-less is why many got the XS Max to begin with! The overall feel of the product is definitely premium. The first isn’t really a problem but worth noting for anyone who didn’t use a battery case with such a large capacity before: this case is thick and heavy! Coming off of a previous battery case with less capacity this took me by surprise but I suppose I can get used to it. The second thing is something the manufacturer did. When it charges the phone to 100% it turns off automatically. Sounds fine if you want to drain your phone first then turn the case on. If that’s your style then ignore this point. However I like to keep my battery cases on and let them drain first (which is the behavior of Apples own battery cases). This allows me to ditch the case later in the day and have a lighter phone with 100% battery. Also allows me to drop off the case at home to recharge it while still being able to use the phone or even go out. The last benefit to that is that by not putting too many cycles on your phone battery they’ll last longer before they need to be replaced too. As I mentioned these are minor points and based on my subjective opinion. 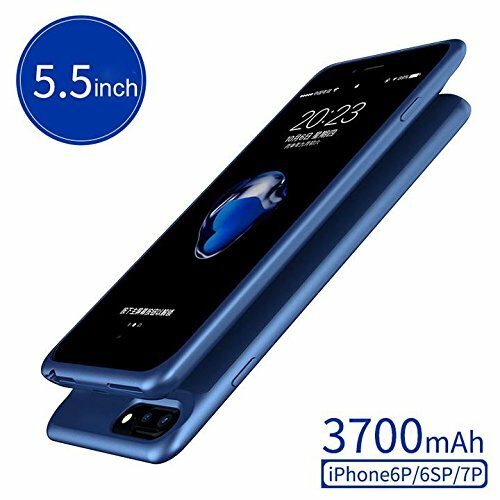 If keeping the case on all day to save your phones battery and the weight of the phone aren’t an issue for you, this is a perfect buy. Great quality. Looks good, feels good and does the job. Pleasure to do business with. I use my phone to listen to music on Bluetooth headphones for 10 hours a day. With this case I have plent of battery life left at the end of the day. Only thing I would change is offering color choices on the case. Just as described fast delivery. High quality battery case. I am felling good about this purchase and i am able to charge it with the same charger as my iphone charger. Also Qi charges! The case works awesome and the wireless charging function works well, you do need to find the sweet spot though to get it to charge. The iPhone X’s max is already heavy and this case adds to it. The good definitely outweighs the negatives in this case though. I’m happy with my purchase. First battery case that I’ve found for the XS Max to wireless charge both the case and the phone together and have a lightning input. Feels solid, a bit thick but battery cases are, but what I said tells it all- it’s the only case to date that uses lightning and wirelessly charges. The only negative that I can really give is the heaviness / thickness compared to the other battery cases I have for my XS Max. It is noticeably thicker than all other battery cases I own. That combo makes it the only battery case for me. 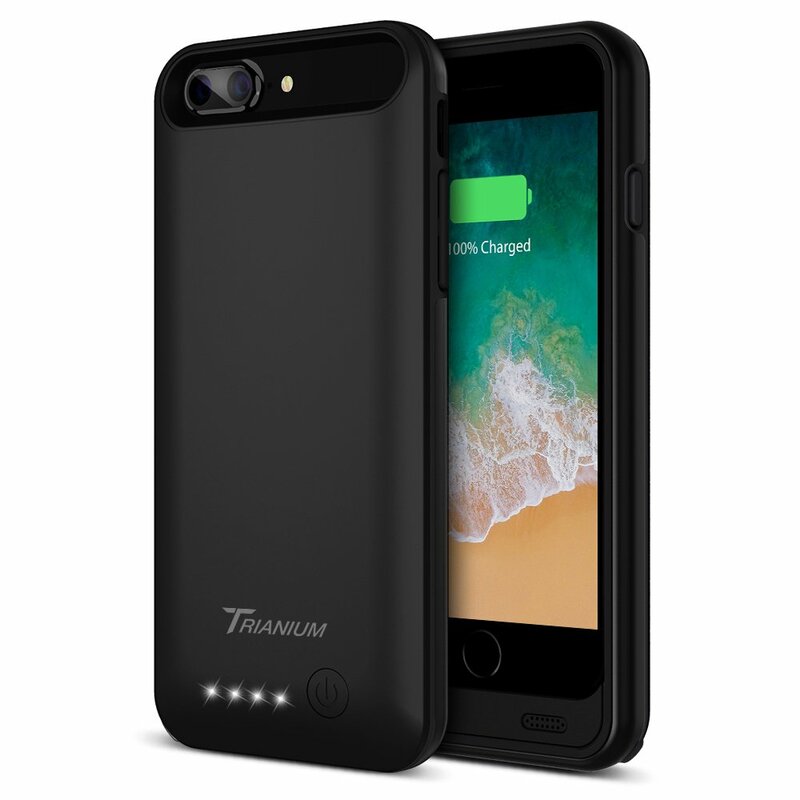 I had looked at several different Battery Cases for the iPhone Xs Max. This case checks all of my boxes. 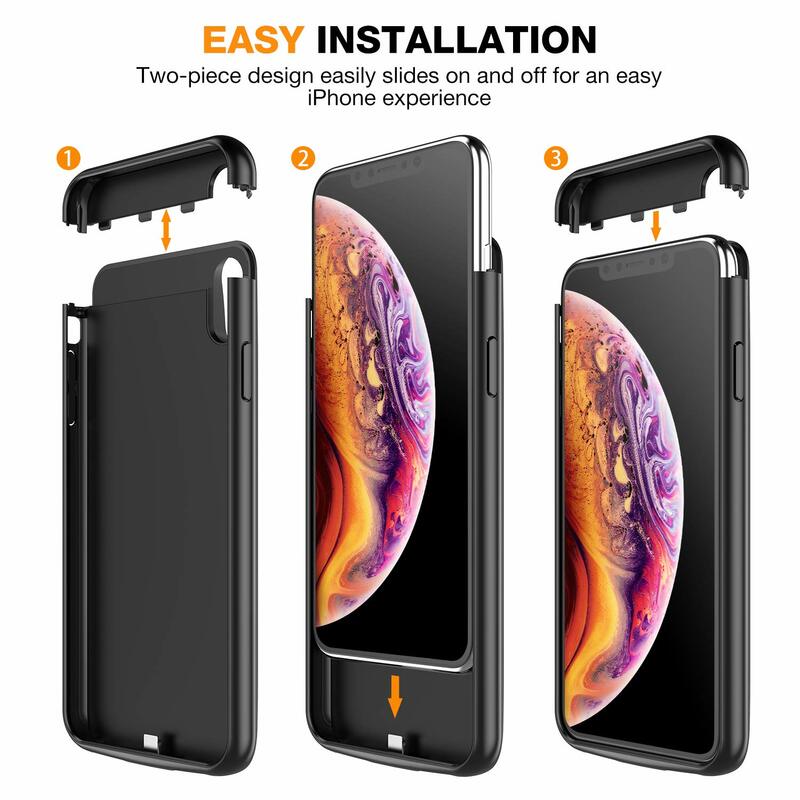 Provides Qi Charging, easy to insert and remove the device from the case, and CarPlay/Sync capability without removing the case. 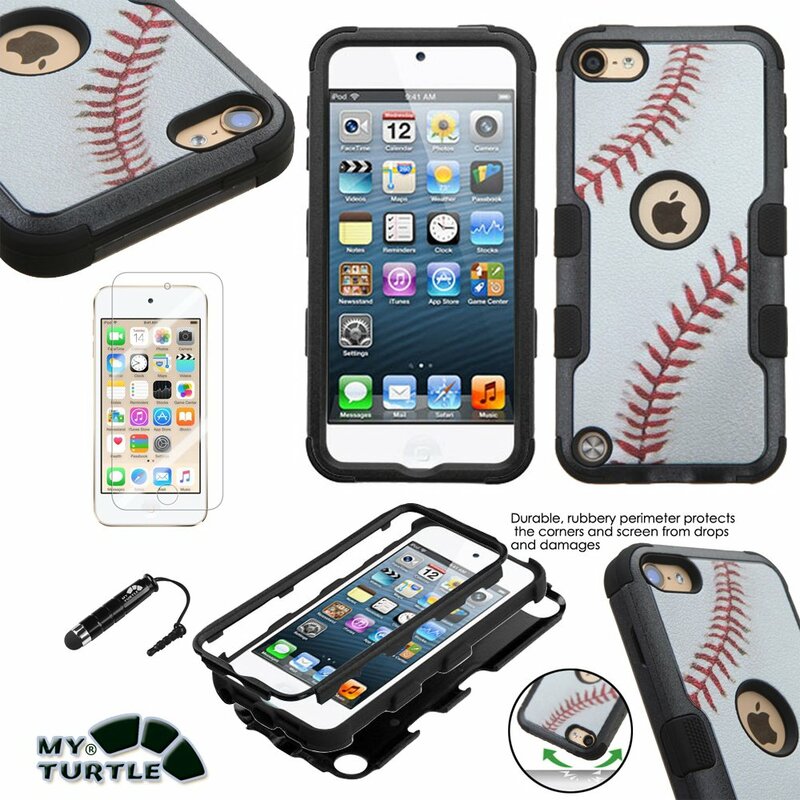 This case does it all. It does add a little weight and girth to the device, but it is well worth it for the features it provides. Why wait for Mophie to develop a battery case for you Xs Max when Snowpink does a fantastic job. Well Done! If you are wanting a nice not so bulky this is the one. The feel is very comfortable to the hand and it uses the lighting charging cable which is a plus. If you purchase one you will not regret it. !